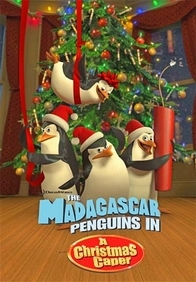 The Madagascar Penguins in a Christmas Caper is a computer-animated short produced by DreamWorks Animation. The 12-minute Madagascar spin-off features the adventures of four penguins, sometimes known as the Madagascar Penguins, who live in the Central Park Zoo and are trained as spies. The short premiered in theaters on October 7, 2005 with the stop-motion film Wallace & Gromit: The Curse of the Were-Rabbit. It was directed by animation veteran Gary Trousdale, produced by Teresa Cheng, and written by Michael Lachance. Focusing on the Madagascar penguins and taking place before the events of the first Madagascar, the youngest penguin on the team, Private, slips out of the zoo on Christmas Eve to find a present for a lonely polar bear named Ted. While roaming the streets of Manhattan, he is captured by Nana (the mean old lady from the first film) who mistakes him for a chew toy for her vicious dog, Mr Chew. The other three penguins, Skipper, Kowalski, and Rico, rescue Private from Nana's apartment before it is too late. They escalate into chaos against Mr. Chew, all-the-while, not noticed by Nana, who is occupied watching a football game. When they are done, they detonate the door with a stick of dynamite (which Rico had repeatedly attempted to use prior), finally attracting Nana's attention and leaving Mr. Chew to take the fall for what the penguins have done to her place. At the end of the film they invite Ted to their home. But he has already invited several other guests, resulting in a massive sing-a-long to a parody of Jingle Bells. The original music for the short was composed by James Dooley. According to Dooley, he was asked to score because he "had written all the music for the penguins in the feature length, Madagascar." The Madagascar Penguins in a Christmas Caper was released on the later DVD editions of Madagascar, Shrek, and Shrek 2, all of which were released on November 15, 2005. It was released on Blu-ray on September 23, 2008, as a bonus feature attached to Madagascar. ^ Zsolt, Biro; Kulics, Laszlo (June 24, 2006). "Interview with James Dooley". Filmzene.net. Archived from the original on February 1, 2010. Retrieved September 27, 2014. ^ McCutcheon, David (December 8, 2005). "Madagascar". IGN. Retrieved August 12, 2012. ^ "Shrek & Madagascar Penguins in a Christmas Caper (DVD) (2001) (Region 1) (US Import) (NTSC)". Amazon. Retrieved August 12, 2012. ^ "Shrek 2 & Madagascar Penguins in a Christmas Caper (DVD) (2004) (Region 1) (US Import) (NTSC)". Amazon. Retrieved August 12, 2012. ^ "Madagascar (Blu-ray)". High-Def Digest. October 1, 2008. Retrieved August 12, 2012. This page was last edited on 31 March 2019, at 17:00 (UTC).